Noting the place of museums as cultural sites in civil society, Ivan Karp writes, “Museum collections and activities are intimately tied to ideas about art, science, taste, and heritage.” In this article, I want to focus on two ideas intimately connected with museums in Karp’s list, namely taste and heritage, as they are represented in the rhetoric of the Liberace Museum. Karp states that museums “are bound up with assertions about what is central or peripheral, valued or useless, known or to be discovered, essential to identity or marginal.” This may be read as a comment upon taste and identity as they are constructed at and through museums. At the Liberace Museum, I read not only the celebration of the life of Liberace, but, more importantly, the cultural ideas that Liberace embraced, represented, and promoted. The idea that I will develop throughout this paper is that the museum presents Liberace as a kitschy question to and ultimately an affirmation of the American dream. The museum functions rhetorically by asking that audiences first identify with Liberace and then, through that identification, question privileged ideas of authenticity and taste, which are essentially contests of culture. To focus on the Liberace Museum, especially in connection with ideas as grand as taste and the American dream, might seem odd. Liberace died in 1987, and the public is beginning to forget just what a popular culture superstar he was. Liberace set attendance records and had successful television and recording careers. Were the Liberace Museum merely the embodiment of one rich man’s ego, I would not be so interested in it. But as an entertainer, Liberace’s wealth was a result of his wide appeal to middle-class fans across the nation. His success was largely predicated upon his musical talent and ability to connect with his fans through his personality and costuming, an often material rhetoric redisplayed and expanded upon in the museum. The Liberace Museum is located in Liberace Plaza, a strip mall about two miles east of the main Strip in Las Vegas. The museum opened in 1979 and is managed by the Liberace Foundation, a non-profit supporting the arts. Location is important in considering the Liberace Musuem because its physical and cultural setting influences how it is constructed and received. Carole Blair and Neil Michel remind us of the importance of attending to the material conditions of a cultural site, such as a monument or museum. 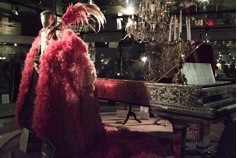 Building upon Blair’s earlier work, they advocate “attention to issues of rhetorical materiality at two levels: (1) the material conditions, contexts, and other discourses that articulate with a given rhetorical artifact, and (2) the materiality of the rhetorical artifact itself.” While we may view the Liberace Museum itself as a rhetorical artifact, while also comprised of additional artifacts, we will examine those individual artifacts soon. First let us consider the museum’s “material conditions” and cultural context as they are important considerations in its reception. It is in Las Vegas that Liberace reached the pinnacle of his entertainment career. Las Vegas is also a city associated with extravagance, mass and popular culture, “bad taste,” and the idea of personal reinvention, all ideas associated with Liberace. The city and the museum culturally reinforce one another. Las Vegas is a city thought to be without a history, a city to be appreciated for what it is at any particular moment. Liberace’s style of entertainment may be considered postmodern in many of the same ways. It is difficult to imagine the Liberace Museum in Washington, D. C., Boston, or another city more widely associated with cultural refinement, privilege, and “good taste.” In Las Vegas, however, the home of casinos modeled after pyramids and English castles, “good taste” is less a concern. 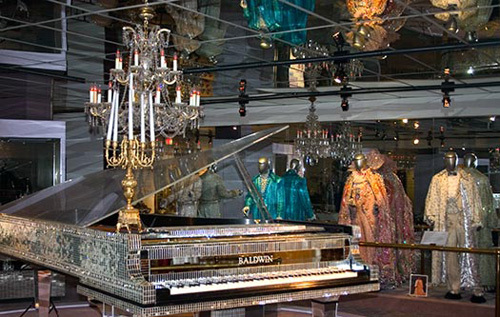 The Liberace Museum has been well received in the city, outlasting local branches by more respected enterprises, such as a recent collaboration by the Guggenheim and the State Hermitage of Russia. The museum is divided into two buildings on opposite ends of the plaza’s parking lot. Greg Dickinson, Brian L. Ott, and Eric Aoki identify three primary rhetorical practices of museums: collecting, exhibiting, and (re)presenting. Exhibiting entails “situating, locating, and (re)contextualizing artifacts in actual spaces.” The museum’s divided situating of its collection changes how those items are received in association with one another and the larger project of the museum. The older, smaller, and more traditional building of the Liberace Museum houses the auto collection, the piano collection, and a wall of pictures and text blocks telling the story of Liberace’s life. The second and larger building houses the gift shop, costume and jewelry collections, furniture and antiques, and commemorative plaques, such as for Liberace’s philanthropy. The newer building is of a less traditional architecture to match the more flamboyant collection it contains. Thus the material conditions of the museum and its separate building exhibitions divide the entire collection in two fairly distinct parts, the first being more biography and the second more material and commemorative. The effect is of two separate museums acting together rhetorically to give a fuller picture of Liberace. Museum visitors are instructed to enter the museum buildings in order, with biography portion first. Here, I will do the opposite in order to highlight Liberace’s life story at the end as it connects to larger ideas of national identity. 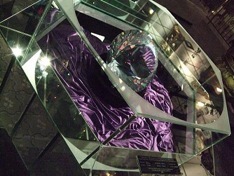 The crown jewel of the Liberace Museum collection is the world’s largest rhinestone, 50 pounds and 115,000 carats of sparkle given to Liberace by the Swarovski Company for his patronage and general promotion of rhinestones. Art critic Dave Hickey names the rhinestone his favorite object in the museum and emblematic of an egalitarian “honest fakery." Hickey writes that the Liberace Museum as well as Las Vegas in general question authenticity, preferring honest fakery to fake honesty. In Hickey’s words, “One either prefers the honest fakery of the neon or the fake honesty of the sunset - the undisguised artifice of culture or the cultural construction of ‘authentic’ nature - the genuine rhinestone, finally, or the imitation pearl.” The distinction Hickey is making is that honest fakery allows an appreciation of a scene or object for what it is without deferring to culturally-imposed ideas of beauty considered to be “authentic.” Hickey finds that within the Liberace Museum, "Everything fake looks bona fide. Everything that Liberace created or caused to be created as a function of his shows or of his showmanship (his costumes, his cars, his jewelry, his candelabra, his pianos) shines with a crisp, pop authority. Everything created as a consequence of his endeavor (like the mega-rhinestone) exudes a high-dollar egalitarian permission - while everything he purchased out of his rising slum-kid appetite for ‘Old World’ charm and ancient regime legitimacy (everything ‘real,’ in other words) looks unabashedly phony." Before considering further specific items in the Liberace Museum, I want to address the place of taste and culture in the rhetoric of museums. Taste is an important quality of museums, which are generally considered depositories and promoters of “good” taste. Karp links the representation of taste in museums to a pedagogical mission, writing, “As repositories of knowledge, value, and taste, museums educate, refine, or produce social commitments beyond those that can be produced in ordinary educational and civic institutions.” Representations of taste may then be understood to act rhetorically by making requests upon the audience, an audience of people who did, after all, spend money to have their ideas of taste challenged or confirmed. Taste in a museum is constructed through the rhetorical actions that Dickinson, Ott, and Aoki identified: collection, exhibition, and (re)presentation. These dynamics are on display at the Liberace Museum as it functions to reinforce social identities and commitments “beyond those that can be produced in ordinary educational and civic institutions” through its collection and representation of that collection. The display at the Liberace Museum could be found nowhere else. This museum questions the privileged ideas of “good” taste and asserts a more egalitarian idea of taste as the appreciation and enjoyment of objects as they are encountered first materially. These rhetorical moves are evident in the display and description of the objects. As the most popular objects in the collection, Liberace’s costumes, automobiles, and jewelry are presented largely devoid of context or history outside of their own materiality and company within the museum. These items are valued for what they are, but this is a difficult idea because they too have associations and cannot be fully divorced of cultural or historical ideas. The items are grouped and arranged by category. As one popular set of objects, the costumes fill much of the second building, lining the walls like a standing audience. We also learn that this “spectacular” costume was made especially for Liberace’s Easter show and that he wore it as he entered from a giant Faberge egg. Any larger cultural or historical significance to the object is not discussed, although one wall of the building is dedicated to the talented designers who made Liberace’s costumes. The rhetorical effect of this artifact’s exhibition then is not so much to persuade the audience of its great cultural or historical significance but to name the object and allow people to appreciate it for simply being “spectacular.” There seems nothing else to “get,” as Hickey would say, no other lesson to be learned, no pretense to be more than a Hot Pink Turkey Feather Costume. Contrast that costume with the “fake honesty” of Liberace’s antique pianos and furniture. 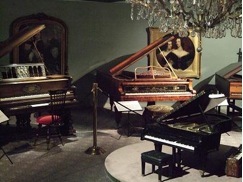 Two types of pianos may be seen in the Liberace Museum, the antiques and the Liberace show pieces. The antique pianos, such as the Kuhn & Ridgeway Harp Piano of 1857, indeed appear drab and out of place alongside the show pianos covered in mirrors and topped with candelabras. The same goes for the furniture. Notably, the description panels for these antiques try to put the pieces in a historical context, relying upon a piece’s place in a historical narrative rather than the piece itself to lend it significance. The value of the piece then depends upon a significance informed by cultural taste, history, and an appreciation of the “authentic” antique rather than upon a viewer’s direct relationship to the piece itself. This is on display in the lengthy historical description of the Louis XV Style Rococo Desk of 1760, which, to be fair, is also a fairly impressive object beyond its historical significance. The difference is that the audience is instructed to rely upon history as recounted in the descriptive panels in order to fully appreciate the desk. We need only see the mirrored piano to immediately be impressed by it. There is nothing to “get” with the piano. In its challenging of “good” and “bad” taste, in its celebration of popular culture, the Liberace Museum may be considered a museum of kitsch. Clement Greenberg in a landmark 1939 essay describes kitsch as a popular challenge to avant-garde art. Linking kitsch to matters of culture and taste, Greenberg writes, "All values are human values, relative values, in art as well as elsewhere. Yet there does seem to have been more or less of a general agreement among the cultivated of mankind over the ages as to what is good art and what bad. Taste has varied, but not beyond certain limits… We may have come to prefer Giotto to Raphael, but we still do not deny that Raphael was one of the best painters of his time. There has been an agreement then, and this agreement rests, I believe, on a fairly constant distinction made between those values only to be found in art and the values which can be found elsewhere. Kitsch, by virtue of a rationalized technique that draws on science and industry, has erased this distinction in practice." Liberace’s art would almost certainly be a challenge to the historical ideas of “what is good art and what bad.” Greenberg bemoans the arrival of kitsch because it does not participate in a particular historical, cultural, and artistic development, even if kitsch may produce some works seemingly of value. Greenberg associates kitsch with industrialization, urbanization, and immigrant populations that have become divorced from their more authentic folk traditions. He contrasts the new to the old, finding the old more significant and the new lacking distance from the old. Building upon Greenberg’s argument, Ruth Barton connects kitsch with nostalgia and contends that "kitsch could be considered the postmodern artifact par excellence. Embraced by a generation of artists bent on exploding the canon of good taste, it has, more often than not, found itself festooning elite gallery spaces whilst simultaneously retaining its shelf life as consumer item of choice for, amongst others, the tourist industry." There are many connections in this description of kitsch and the items on display in the Liberace Museum, which likewise functions to explode the canon of good taste while maintaining its relationship to consumerism and the tourist industry in Las Vegas. The Liberace Museum may be read as a direct and material championing of the egalitarian, immigrant, and popular culture values associated with kitsch. There is a critique to be made that the museum is too celebratory of materialism, and the museum panels do indeed read at times like catalogs. In the museum, kitsch takes center stage and steals the show from more esteemed valuations of art. Liberace’s very life corresponds to Greenberg’s characterization of kitsch as an immigrant, urbanized, and popular form. Indeed, Liberace’s story and kitsch may be read together as subversive rhetorics of the American Dream. A lengthy display wall in the first museum building is dedicated to the story of Liberace’s life. To offer here a condensed version, Wladziu Valentino Liberace was born 1919 near Milwaukee, Wisconsin, to a Polish-American mother and immigrant Italian father. His father played the French horn and encouraged his sons’ musical development. Liberace began playing the piano at age four and worked his way from nightclubs to performance halls and eventually television and the Strip. He died in 1987 due to complications from AIDS. After his death associates reported Liberace’s homosexuality, although Liberace never explicitly identified himself so in public. Much attention has been devoted to Liberace’s sexuality. As an effort to safeguard his career and mass appeal, Liberace successfully sued for libel publications that alleged him to be a homosexual. At the same time, however, Liberace performed his homosexuality without explicitly stating it. Hickey reminds us that Liberace was working during a time in which a full public disclosure of homosexuality was more dangerous than would be the case today. Dave Hickey credits Liberace a “rhetoric of deniable disclosure” in which Liberace made public and simultaneously denied his sexuality. 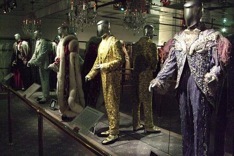 The elaborate costumes, jewelry, and rhinestones were the rhetorical means through which Liberace spoke, a rhetoric on display at the museum as well. As was the case in Liberace’s life, his sexuality is also left implicit in the museum. The narrative of his life mentions his death through complications of AIDS but makes no reference to a private life. The narrative presented of Liberace’s life is one of the American dream. He is depicted as the son of an immigrant family who achieves success through hard work, talent, and opportunity. This is a narrative of possibility and self-creation. In this narrative immigrant and American identity become central. Dickinson, Ott, and Aoki argue that museums, and history museums in particular, “function as rhetorical invitations to collective memory and national identity.” Those rhetorical invitations are material and textual, sites that “engage audiences in compelling historical narratives." In the case of the Liberace Museum, the compelling historical narrative is directly associated with current ideas of American identity because only in American would a life like that of Liberace be possible. His life is presented as an undeniably American one, his museum as much the same. 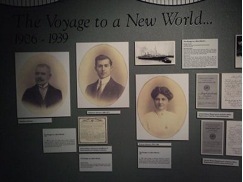 The biographical wall at the museum displays quotes, dates, photos, commemorations of significant events, and replications of documents, such as citizenship papers and contracts. The theme of the wall is captured in the introduction where printed on the wall is: “This is the story of a poor Wisconsin boy, son of European immigrants, who through his great musical talent and fabulous personality became an icon of show business and the epitome of the American dream.” The identification with the American dream is obvious here. The wall then charts Liberace’s life from the first panel, titled “The Voyage to a New World,” through “The Making of a Legend” and “American Icon,” to the last panel, “Legacy.” Displayed are photos of Liberace as a child, with his family, learning to play the piano, starting out on a show business career, and eventually reaching pop superstardom. Quotes from Liberace’s books are provided as editorial in which he comments upon aspects of his life. The rhetorical effect of this biographical narrative is to put the audience in the company of Liberace, to introduce a particular representation of him to the readers, and to present Liberace’s life not as an anomaly but as a reaffirmation of the American dream. In that respect, audiences, as fellow Americans, are party to Liberace’s success and are then welcome to enjoy the splendor of that success as they browse his collection. Ralph Cintron concludes his ethnographic work Angels’ Town with an invitation to what he calls “the saving grace of critique” to expose the illusion of completeness and control in writing. I see value here. Writing is always incomplete, a move to make more concrete and manageable ideas that otherwise remain diffuse, though they may be fuller in their diffusion and abstraction. I would like to extend a similar invitation to critique by acknowledging some of the tensions underlying this article. No doubt, I could have been more critical of the Liberace Museum for its materialism and superficiality, and some of the distinctions I make are not so neat. I chose instead to focus on the rhetorical strengths of the museum. This is a choice made, I am sure, because I want to respect, enjoy, and genuinely like the museum, although that desire is contrasted at times with a desire through my own enculturation or education or some other idea associated with elitism to leave me unimpressed with a mirror-covered piano. Silly, I know. This is not so much the cultural rhetorical analysis of a Liberace fan as one of a Las Vegas native who identifies with Liberace primarily through locality, or at least did before visiting the museum. Although I am not generally a fan of the postmodern, a philosophy often associated with Vegas as well a Liberace, I have a fondness for the city, its people, cultural inventiveness, lack of pretension, and some of the other ideas although not all of them that Vegas and Liberace represent.